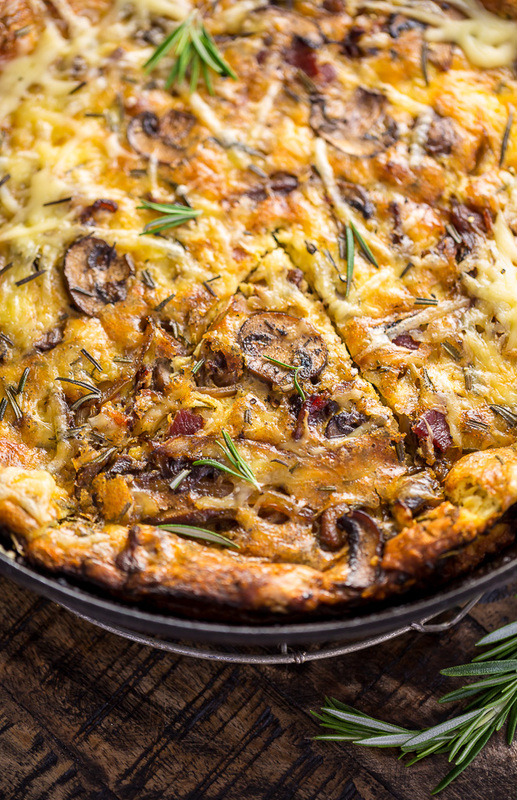 This Mushroom, Bacon, and Swiss Frittata is so easy and perfect for brunch! Delicious served warm or cold! We have so many Spring holidays on the horizon and you know what that means, right? BRUNCH! 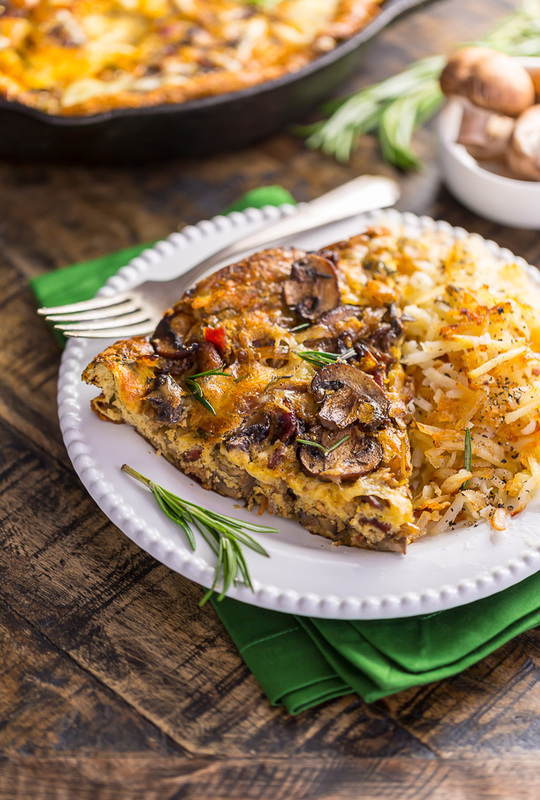 And nothing says brunch quite like a fluffy and flavorful frittata! For this post I’m teaming up with my friends over at Jarlsberg®! Have you had their cheese before? It’s the #1 specialty cheese brand in the USA, and in my heart! It’s a mild cheese, with a slightly sweet and nutty taste. It was a staple in my childhood and I can still see my mom standing at the kitchen counter slicing it up for sandwiches and salads. And now that I’m grown and living on my own, I always have a wedge hiding in my fridge for snacking. Hello, wine and cheese nights! 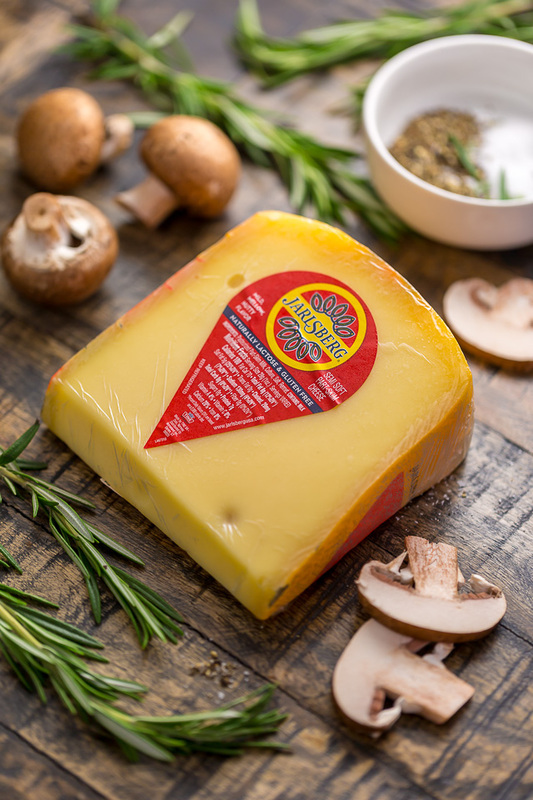 But for this post, I wanted to use their versatile cheese to create an extra special recipe for you. And so this Mushroom, Bacon, and Swiss Frittata was born! It’s so easy, so flavorful, and perfect for sharing with your family and friends. 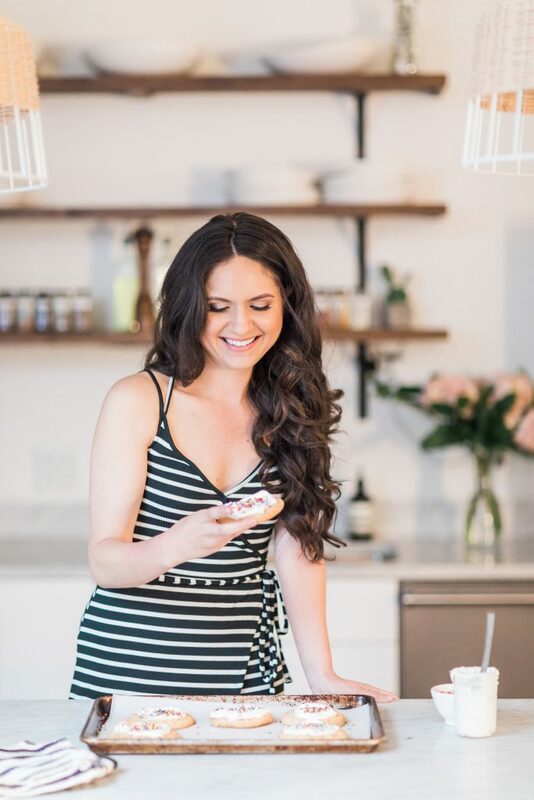 Personally, this is my go-to brunch recipe and I’m already planning on making it for Easter and Father’s Day! But feel free to add a salad and serve this for dinner. I do it all the time and my family loves it. But then again… who doesn’t love breakfast for dinner? If you’ve never had a frittata before, please don’t be put off by its fancy name! Because making one couldn’t be easier. Basically, a frittata is a giant omelette that’s much simpler to assemble and requires no flipping. It looks so elegant on the table and your guests will never guess just how effortless it is to make! WINNING. I like to stick my cheese in the freezer for about 10 minutes before shredding it. This is totally optional, but I do find it makes shredding the cheese easier. And I’m all about easy! If you don’t eat bacon, you can easily leave it out of this recipe! Trust me, between the cheese, mushrooms, onions, and rosemary, you’ll still have plenty of flavor. Because dried rosemary doesn’t add the same flavor, I highly suggest using fresh! 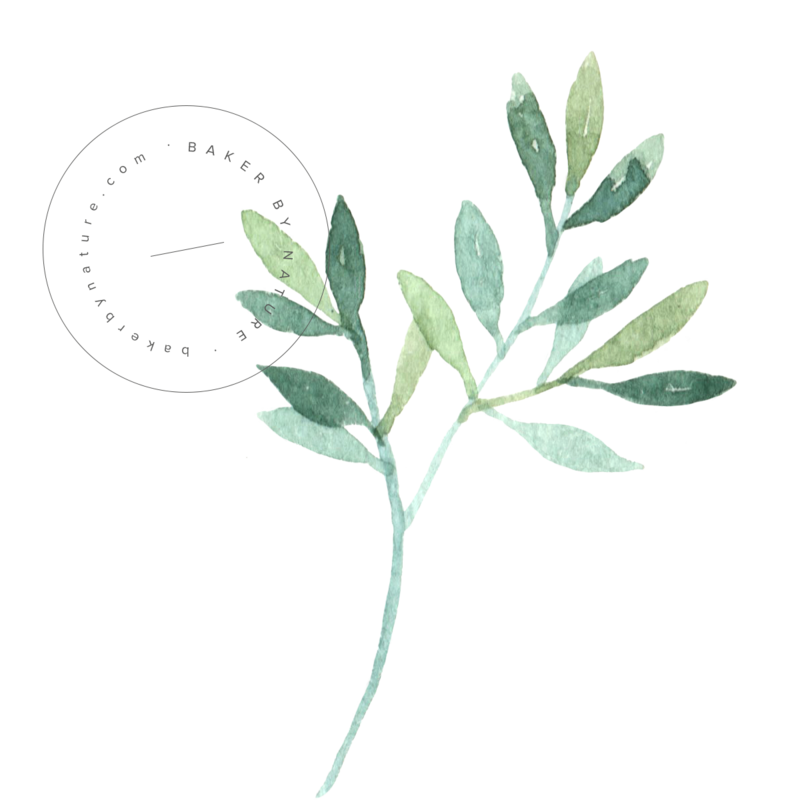 If you don’t care for the flavor of rosemary, fresh thyme makes a lovely substitution. I used sweet yellow onion in this recipe because it’s what I had on hand, however red or even white onions may be used. 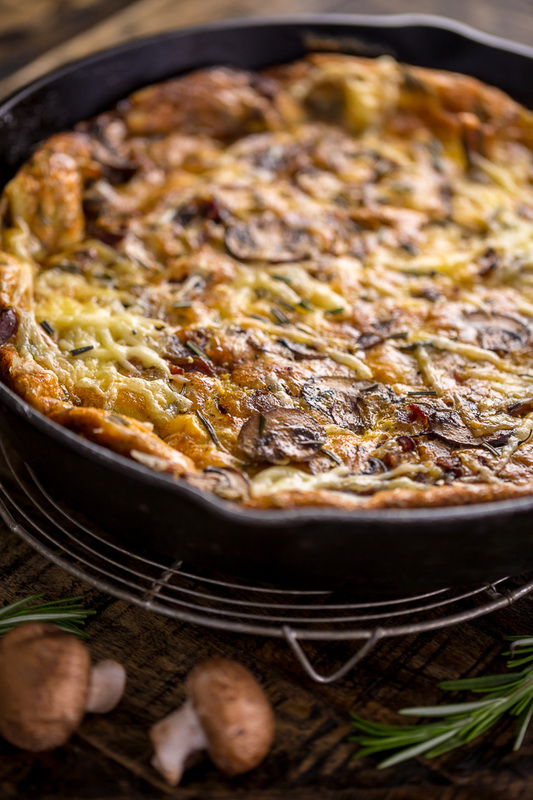 If you don’t own a cast iron skillet, you may bake this frittata in a large casserole dish or even a pie plate. Just be aware that this will alter the thickness of the frittata and that the baking time will be likely be different than what I have listed in the recipe box below. You’ll know it’s ready to come out of the oven when the top is completely set and it’s a deep golden brown color. I find this frittata is equally delicious warm or cold! But I know many prefer it warm. So if you’d like to make this ahead of time, simply bake it and store it in the fridge, then reheat it in the oven for a few minutes before serving. The frittata will keep, covered and stored in the fridge, for 3 days! I haven’t tried freezing it, so unfortunately I can’t advise on it being freezer friendly. But my honest guess is it’s not. Because this frittata is quite hearty, you can go simple with the side dishes! I typically serve it with a fresh salad, breakfast potatoes (I always toss a handful of Jarlsberg® in them so they’re nice and cheesy! ), and some orange juice. But I’d love to hear what you pair yours with in the comments below. 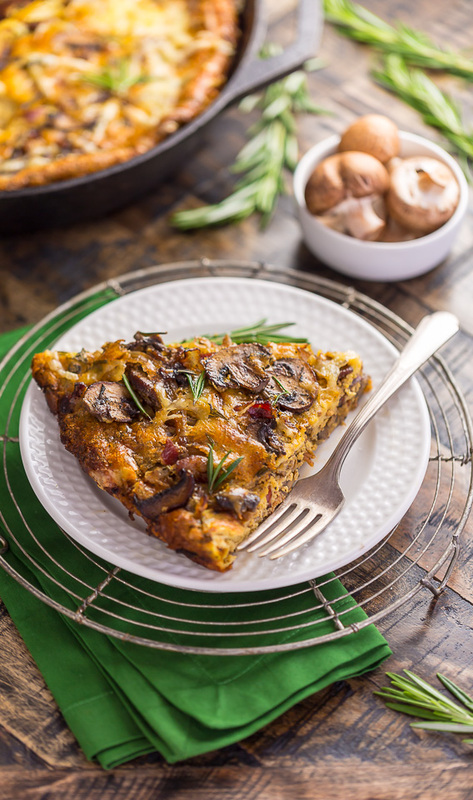 If you try this recipe for Mushroom, Bacon, and Swiss Frittata, let me know! Leave a comment below and don’t forget to snap a pic and tag it #bakerbynature on instagram! Seeing your kitchen creations makes my day. In a large bowl, whisk together eggs, heavy cream, milk, black pepper, and salt. Set aside. Cook bacon in a 12-inch cast iron skillet over medium heat, stirring, until crisp. Using a slotted spoon, transfer the bacon to a large plate. Drain bacon fat from the skillet then place it back over medium heat. Melt 2 tablespoons of butter in the skillet. Add onions and cook, stirring occasionally, until tender and lightly browned, about 10 minutes. Add in the garlic, mushrooms, and rosemary and cook, stirring frequently, until mushrooms are golden brown and garlic is fragrant. Season with salt and pepper. Using a slotted spoon, transfer the onions, mushrooms, and garlic to a large plate. Place the skillet back over medium heat and add remaining butter. Add the egg mixture to skillet, then top with the bacon, mushrooms, and onions. Cook for 4 minutes over medium-heat without stirring or moving the eggs in any way. At this point carefully transfer the skillet to the oven. Bake until the top is golden brown and the frittata is set; about 30 minutes. Sprinkle the frittata with cheese and place under the broiler until just melted. Serve warm. I love mushroom..its my favorite.. Thank you so much Ashley for this recipe.. I will definitely try this dish for coming holiday. My mouth started salivating already.I cant wait to try this.Definitely gonna try this.I could have made it today itself, but no mushroom in stock right now. Will tell the review after preparing.